The history of Kindervelt and that of the Cincinnati Children’s Hospital Medical Center are bound together to achieve a center of excellence in pediatric health care in Cincinnati by years of planning, building and working together. Prior to the opening of the Convalescent and Services Pavilion in 1973, many services were scattered all over the Cincinnati area. Some of these services already had auxiliaries devoted to supporting and aiding their organization. As these institutions merged into the medical center’s family, they brought their auxiliaries with them. The Cooperative Society and the Jr. Co-Operative Society were actively working for Cincinnati Children’s; the Association of Volunteers supported the Convalescent Hospital for Children; the Capital United Cerebral Palsy Women’s Committee aided United Cerebral Palsy; and the auxiliaries to the Children’s Dental Care Foundation and Adolescent Health Center supported their groups. It became apparent to the Cincinnati Children’s Development Director, Mr. Willard Baily, that an auxiliary working to support the new Cincinnati Children’s would be a great asset to both the medical center and the community as a whole. In July of 1971, he enlisted the support of Cincinnati Children’s board member, Barbara Robinson, to help communicate his idea to the Board of Trustees. After receiving approval, he called together a group of energetic women to discuss his plans. His experience with Twigs at Columbus Children’s in Columbus, Ohio provided the pattern for the auxiliary he proposed. This pattern consisted of semi-autonomous groups of neighbors or common interest groups working together for the common good of the medical center. They called this idea Kindervelt – German for “children’s world”. The first community Kindervelt was formed almost immediately in Indian Hill with Jean Leonard as its chairman. By the end of 1971, there were five Kindervelt groups and a year later, there were twenty! Although the original pattern of organization found the Board of Trustees and the chairmen of the local Kindervelt groups meeting once a month, it soon became obvious that the chairmen needed a different kind of format than the Board. Therefore, it became established practice to meet once a month with just the Board members in a policy-setting session, and once a month with both the Board and the chairmen of the community Kindervelt groups in a session directed toward communication and problem solving. The need for certain skills was also felt by many of the members of the newly formed organization. Therefore, the process of leadership training and other related skill training for both the Board members and the new chairmen became part of the Kindervelt experience. The burgeoning organization faced many decisions and growing pains. Slowly the Board began to get the feel of things and helped the community Kindervelt groups develop projects that met the goal of Kindervelt – “having fun while raising funds”. Citywide projects involving participation by all Kindervelt members were a problem for the organization. Many groups wanted to take advantage of Kindervelt’s marketing possibilities to sell their merchandise or tickets. Although some of these groups represented very worthwhile causes, it became apparent to the Board that the Kindervelt effort could very easily be diluted by outside organizations. The use of Kindervelt for any purpose other than its stated one was discouraged. Occasionally, however, an opportunity presented itself that seemed to benefit both Kindervelt and the sponsoring organization. Such a project was the Children’s Theatre benefit. The board of the Children’s Theatre first approached Kindervelt in 1972 with the idea of sponsoring a benefit performance to be shared by the two organizations. The Board agreed and the citywide project was successfully conducted until 1976. After which, the Board turned the project over to a community Kindervelt group to be continued by them with yearly approval from the Board. In 1972, the Wyoming Kindervelt group adopted the project of selling original pins made exclusively for Kindervelt. They asked the Board to suggest some designs for the pin. As a result of the ensuing discussion, the official Kindervelt logo was adopted. It was designed to depict the two kids from the Cincinnati Children’s logo surrounded by a circle which symbolizes the world. (This is often referred to by members as the circle of Kindervelt love.) Subsequently, the logo appeared on many items sold by Kindervelt. This created the concern of quality control and was one of the factors which led to the establishment of a Projects Committee and criteria for all proposed projects. As Kindervelt grew and developed, one need became apparent – an outlet for the beautiful handcrafted items produced by the Kindervelt ladies was vital. Some groups entered craft and charity fairs, but were discouraged by having to give a percentage of their proceeds to the promoters or the charity of the day. Since the Junior Co-Operative Society of Cincinnati Children’s had traditionally conducted a holiday bazaar, the Board decided to co-sponsor a bazaar in November of 1975. The bazaar, chaired by Nancy Bove for Kindervelt, was held in Vincent Hall. Kindervelt was given the lower level while the Junior Co-Operative Society used the upper level for their items. The overwhelming crowds encouraged Kindervelt to expand their bazaar and the following year, a very successful Kinderklaus Markt was held in the Ohio National Guard Armory on Reading Road. Markt was expanded in 1977 to include its own assiduous, year-round Markt Committee whose Chair sits on the Kindervelt Board of Trustees. In 1978, Kindervelt turned the tables so to speak and offered space to all volunteer organizations within the medical center. United Cerebral Palsy took advantage of the offer and had a successful boutique within Markt. In 2014 Kinderklaus Markt’s name was changed to “Kindervelt Market” to be more recognizable. By 1981, Kindervelt had developed to the point that the Board of Trustees felt the time had come to research the possibilities of another citywide project. Around the same time, Steve Contardi of the USPTA, along with Debbie Merritt Contardi, approached Kindervelt with the idea of a tennis marathon. This was just what the Board was looking for and the inaugural Tennithon was held in 1982. Children from all twelve Greater Cincinnati Indoor Tennis Association Clubs played throughout the night for pledges. They were treated to loads of food and lots of fun. The fundraiser was such a success, both financially and socially, it became an acclaimed annual tennis event in Cincinnati. The admiration for Kindervelt by the Cincinnati community was becoming more apparent. In 1983, Larry Hill of the Queen City Figure Skating Club came to Kindervelt with the idea of being a co-host for the 1987 World Figure Skating Championships should Cincinnati be the select city. The Kindervelt Board of Trustees then sent a proposal to the selection committee. Once Cincinnati was chosen to be the host city, Kindervelt, along with the Queen City Figure Skating Club and The Skating Club of Cincinnati worked diligently to prepare for the Championships. As a result, Kindervelt was thrust into the international limelight and earned nearly $200,000 through its participation! In 1987 Kindervelt, in partnership with Booth Memorial Hospital, became co-beneficiaries of the Mason-Dixon Steeplechase. The Steeplechase provided tremendous exposure for Kindervelt as well as a unique opportunity for “hands across the river” collaboration with an auxiliary from another hospital. When St. Elizabeth Medical Center became the third beneficiary in 1989, a re-organization was implemented. Cincinnati Children’s Hospital Medical Center formed a Steeplechase auxiliary committee in order to facilitate and maintain closer contact with the Mason-Dixon Steeplechase Association. Consequently, Kindervelt no longer participated as an official beneficiary. Over the years, Kindervelt has bestowed several significant gifts to Cincinnati Children’s. In 1976 and 1977, funds were used to purchase specialized equipment for the department of Radiology. The Polytomography U3 was only the second such unit to be installed in a children’s hospital in the United States. Polytomography utilizes body section radiography for in-depth visualization of abnormalities of tissues and bones. In 1978, the Division of Hematology/Oncology used Kindervelt’s gift to purchase an analytical fluorescence microscope. The Intensive Care-Coronary Care Unit purchased several life support systems with the monies received from Kindervelt in 1979. Included were two monitors used for continual observation of a patients vital signs and an EKG machine for recording electrical signals of the heart. The money raised in 1980-1982 was used to help fund the hospital’s new Division of Infectious Diseases. And so, what began in 1973 with its first annual gift to Cincinnati Children’s Hospital Medical Center of $8,000, has become an inspired and flourishing volunteer organization. Because Kindervelt has continued to grow and impact not only the medical community, but all of the tri-state area, the Cincinnati Enquirer honored Kindervelt in 1973 as one of the city’s outstanding woman’s clubs. The honor was repeated two years later when Kindervelt was again awarded a trophy by the newspaper for its outstanding contribution to the role of women in the community. In 1983, Kindervelt was granted another great distinction with the naming of a new institute – the Kindervelt Cardiovascular Institute. The Institute provided a permanent endowment for the Division of Cardiology which supports cardiovascular research at Cincinnati Children’s. Kindervelt’s five-year pledge to the endowment fund ended with over $2,000,000 in gifts. In the fall of 1988, the Cardiovascular Institute was renamed the Kindervelt Cardiovascular Research Endowment Fund. The Division of Pulmonary Biology was Kindervelt’s area of commitment from 1988-1990. At the completion of this pledge, Kindervelt gifted over $1.4 million to endow a Professorship of Pulmonary Medicine and once again proving to leave a lasting legacy when the professorship was subsequently named the Kindervelt Professor of Pulmonary Medicine. Two new citywide projects were added to the long list of activities in 1990. Dr. Earladeen Badger, President and founder of the All About Kids show at the Convention Center, invited Kindervelt to participate in the show by developing an interactive theme area as well as organizing the volunteers and entertainment. In addition, the Cincinnati Rowing Committee asked Kindervelt to help organize the prestigious National Collegiate Rowing Championship held at East Fork State Park. They recognized that Kindervelt is a talented group of women doing outstanding work and that all would benefit from the organization’s involvement. In 1991, Kindervelt committed to help fund the construction of a trauma center being located in Cincinnati Children’s new state-of-the-art hospital tower. The Kindervelt Trauma Center was dedicated in November 1993 and began emergency care and trauma treatment in December of 1994. At the completion of the four-year pledge, Kindervelt’s contributions to the project totaled nearly $2.3 million. In 1995, Kindervelt agreed to raise funds for the Critical Care Medicine Division. This five-year commitment would serve the Kindervelt Critical Care Program – the only one of its kind in the tri-state region. The PICU is a multidisciplinary unit where around-the-clock physician and nursing coverage is provided for all children beyond the newborn age and all pediatric subspecialties are available for consultation. Kindervelt’s next fundraising efforts were to support the Division of Adolescent Medicine. The Division offers resources and support for teens and the physicians who treat them. They strive to provide the highest quality care for adolescents regionally, and through research and education, to improve adolescent health globally. Thanks to Kindervelt’s five-year pledge from 2000-2004, these services have been able to expand to reach an even greater number of youth. A commitment was made for the next four years, to the Division of Developmental Disabilities. Soon after, a new director was appointed and the name was changed to the Division of Developmental and Behavioral Pediatrics. The focus however, remained the same – to provide comprehensive evaluation and treatment services for infants, children and adolescents with developmental and behavioral problems along with community education and professional training for a wide range of disciplines. DDBP utilized Kindervelt monies to undergo major expansion in its clinical, academic, and research, programs, striving to become the premier center in the community. In 2005, the Kindervelt Board of Trustees was looking for a way to recognize individuals who exhibit an enthusiasm and positive attitude toward the goals of the organization. 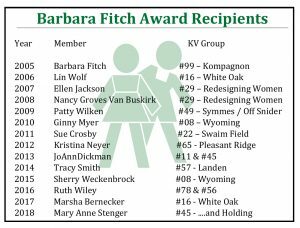 Thus, the Barbara Fitch Award was created and named after the founding member who has since been a prominent supporter of Kindervelt and Cincinnati Children’s. The award is given each year at Kindervelt’s Annual Meeting to a dedicated member who is an ambassador for Kindervelt in the community, who is an active contributor to her local group and who gladly gives her time, talents and energy to promote this worthy cause. In 2008, the hospital named a new pediatric chief of staff in 2008 and Kindervelt was looking for a new giving commitment. Because asthma afflicts 15 million people in the U.S., is the most common chronic disease of childhood and the number one diagnosis for pediatric hospital admissions, Cincinnati Children’s formed the Division of Asthma Research. Kindervelt was then able to assist in establishing the Kindervelt Chair for the Division of Asthma Research and through the 2012 fiscal year, Kindervelt’s dollars will aid the Division in developing new standards for clinical care through novel scientific discoveries and cutting edge research. Kindervelt has demonstrated time and again that it is a way of reaching out; it is building new relationships; it is expanding personal horizons; it is broadening the scope of what is possible; and it is offering hope to others. Big or small, the contribution each Kindervelt member makes is important and puts them at the bedside of the patients at Cincinnati Children’s Hospital Medical Center. Changing the Kindervelt fiscal year to coincide with the Kindervelt calendar year which resulted in Kindervelt fundraising events occurring and counting right up to the end of the Kindervelt calendar year, updating different sections of the Kindervelt Rules of Procedure, launching new Kindervelt City Wide projects to increase community participation as in the first time ever Couples and Pairs Sporting Clay Shoot in Elk Creek, Kentucky, increasing Kindervelt name recognition and support in the Greater Cincinnati and Northern Kentucky community by promoting Kindervelt and Cincinnati Children’s through multi-media, increasing Kindervelt visibility and connectivity through social media by updating and improving the format for the Kindervelt website to make it interactive and by creating a Kindervelt Face Book page, launching new events to increase participation by partnering with local businesses including Down Town Cincinnati Inc with Shop and Eat for a Cause events at Palominos and Saks, The Smart Talk Lecture Series at The Aronoff, and having an event at Gilson’s in Madeira, establishing a new venue for Kinderklaus Markt at EnterTrainment Junction which included Breakfast with Santa to attract young families and increase participation, implementing changes to promote increased involvement in Kindervelt fundraisers, increasing membership by engaging the next generation of volunteers, exploring new opportunities to attract younger members, providing educational training workshops for the Kindervelt Board of Trustees and planning the future training of the Kindervelt membership. One of the very most exciting accomplishments was having Kindervelt honored by Cincinnati Children’s at their eighth annual signature gala, The Celestial Ball. Kindevelt was honored for forty-one years of fundraising and raising over 15 million to support the medical center in a multitude of areas. Kindervelt was honored at the gala for providing the foundation for the development of major medical breakthroughs, state of the art care and one of a kind programs at Cincinnati Children’s and a recognition plaque was placed on the blue wall outside of the Sabin Center at Cincinnati Children’s. In addition to these accomplishments, one of the most significant accomplishments for Kindervelt is being bright beacons of hope for children in need while establishing life-long bonds of friendship as Kindervelt volunteers and members. In 2012-2014, Charlotte “Char” McBrayer was City President. 2012 was the year Kindervelt started our four year commitment to the Heart Institute-Kindervelt Neurodevelopmental, Educational and Learning Center. Research shows that children with complex heart problems are at a greater risk for a wide range of neurodevelopmental issues such as delayed fine motor skills; difficulties with speech and language; attention, behavioral and emotional problems; delayed school preparedness and more. The Neurodevelopmental Clinic was established in October 2011 at Cincinnati Children’s and was the first Hospital in the country to have this state of the art facility to take the child from birth to adolescents with the necessary intervention for the child and their families. Several other hospitals across the country that had this type of facility only took the child to 3 years of age in their program. Kindervelt was so proud to support this Institute at Cincinnati Children’s. During my two years as President the groups raised a total of $940,000 for the, now named, Kindervelt-Neurodevelopmental, Educational and Learning Center. · Citywide Event – “Let the Good Times Bowl” with proceeds over $6,100 in the past two years. · Kinderklaus Markt continues to be a huge success. This will be the 39th year for this event and will be officially called Kindervelt Market to promote awareness to the public that this event is for Kindervelt and Cincinnati Children’s. · HJ Benkens Florist & Greenhouse with an on-going project to give back to Cincinnati Children’s by working with Kindervelt to raise funds. 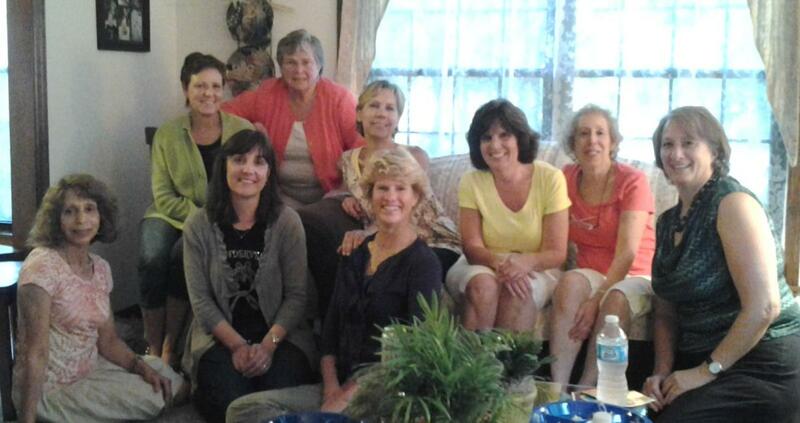 · Along with the citywide fundraisers several Liaison groups planned events. · Updated the name of our Kindervelt Survival Kit to Kindervelt Guidebook. · Updated our Kindervelt Handbook that is given to each member. · Started sending our Kindervelt Newsletter electronically. · Teamed up with Constant Contact to have easier On-line registrations and started Email Marketing and Social Campaigns to keep the public informed of events. · Logo Change – We added to the “circle of love” that surrounds the Kindervelt Kids the name Kindervelt at the top and kindervelt.org at the bottom. Anyone that sees our logo will know what it means. Kindervelt is fun and fulfilling. It’s a way for individuals to make a difference. * Some years that groups were formed are approximate.